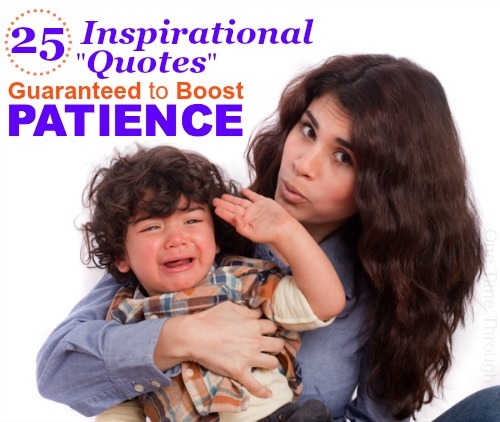 Today I have gathered 25 awesome quotes from all over that are guaranteed to boost your parenting patience. I hope you enjoy reading them as much as I enjoyed collecting and “illustrating” them for you! This post contains Amazon Affiliate links. Please see Disclosure for full details. 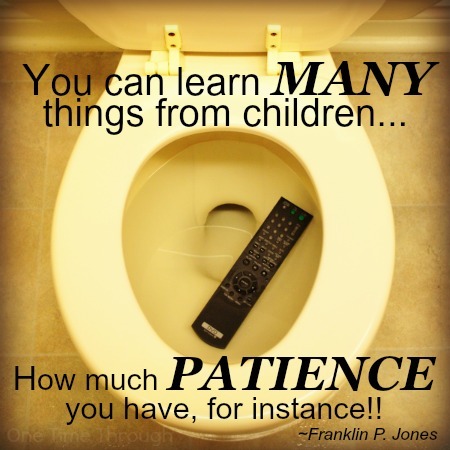 Over the years, friends and co-workers have often said to me, “You have so much patience with kids, Sue. How do you do it?” and I’ve never really had an answer, other than to be embarrassed and to mumble something like, “Well, I do lose it sometimes…just not too often I guess,” or something similar. But the truth is, it does take a lot for me to lose my patience and I don’t really know WHY. What I do know is that when I’m feeling close to losing it myself, I often try to take a few steps back, breathe, and think of something INSPIRING to calm myself down and to help me look at the bigger picture. That’s why I love to read great quotes! 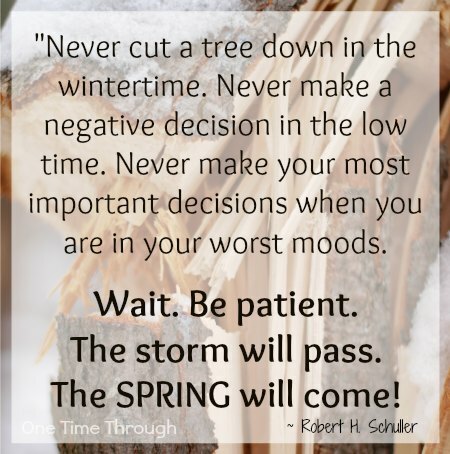 When my brain is searching…desperately searching for any little reason to regain composure, or to extend my patience just that much further, words of wisdom often pop into my mind – either as warnings, or as inspiration. And so I offer to you, 25 amazing quotes (including my contribution above!) 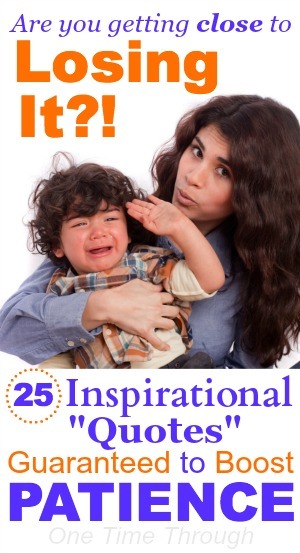 that will inspire, make you laugh, and just maybe – will pop into your head the next time you feel like you’re about to lose your patience with the kids! Probably the one that drives me the most to try to be a better, calmer, more patient parent. It took me a while to learn this one, but it applies to children perfectly. The less I try to control my son, exert my will over his, and demand obedience, the more cooperative, happy and relaxed we all are! Respect the fury of nature – and of nature’s children – so true! I think I’m better at being patient with others than myself sometimes. Are you the same way? But when I’m feeling like a failure as a parent, or like I’m messing everything up, I just remind myself that I’m doing the best that I can with what I know right now. That’s all we can do after all, isn’t it? Definitely seen this one firsthand with my son. This is the reason I’ve learned to start 45 minutes early to get ready to leave for daycare in the morning. Whenever I leave it too late, and I try to rush my son – that’s when I meet with resistance or meltdowns! Yes – flow… and water – I love this analogy! Nothing can withstand the power of water. It is forever patient, persistent and strong, and can flow around obstacles easily. This one makes me giggle! Fake it until you make it right? Driving you crazy that the kids are taking forever to tie their shoes when you could do it in 10 seconds for them? But then, what would that accomplish. So put on an encouraging smile – but better make sure your toe isn’t tapping and your arms aren’t crossed! 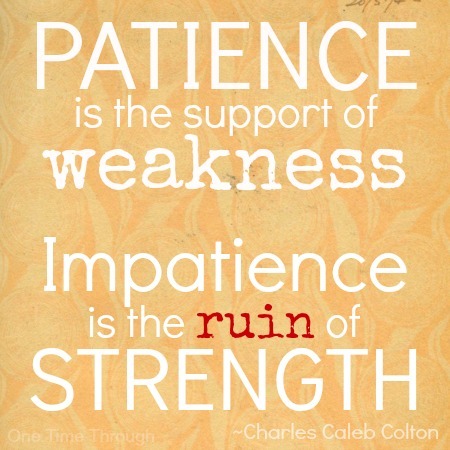 It’s easy to lose your patience, and hard work to control it, but oh, the strength in it! Oh God yes – truer words were never spoken! LOL! I hate being rushed. My husband hates being rushed. And my son hates being rushed. If someone is getting irritated with you when you’re doing the best you can, it feels awful doesn’t it? I don’t want my son to feel that way because of something I say or do… Gotta keep practising that “concealing” thing! Yup! So true. Sometimes I’m trying to rush my son, then I realize it’s going nowhere except starting to bother him, and I ask myself – why do we need to go so fast? And usually, the reason is not really that important after all. 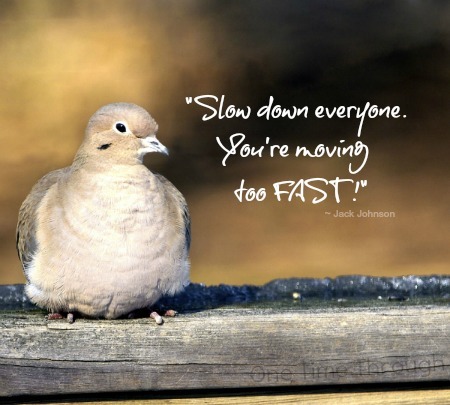 Once we slow down, things always go easier. 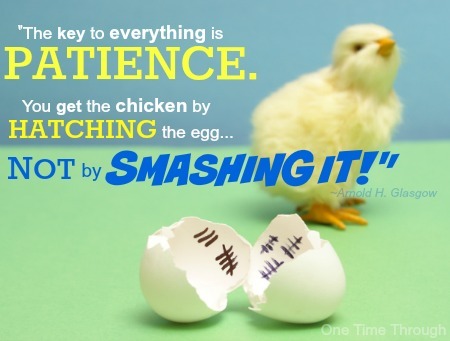 Looking for more ideas for boosting your patience? 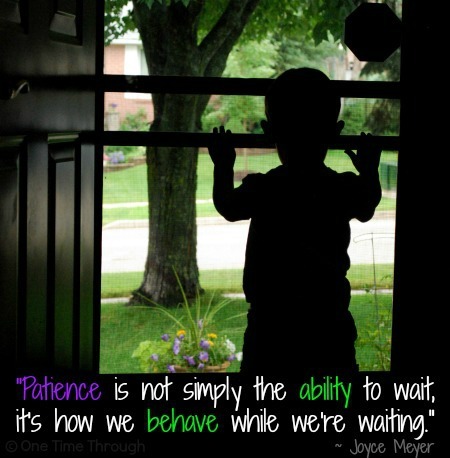 Check out this great post over at Creative with Kids called 5 Ways to Be More Patience. 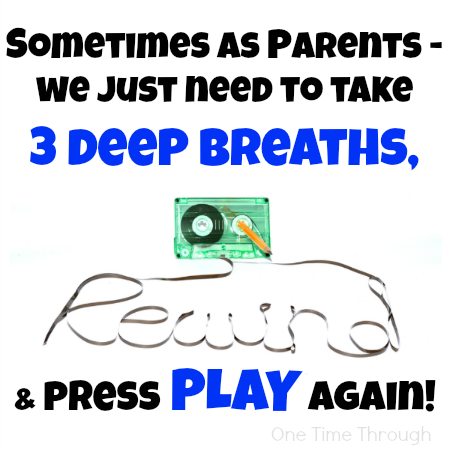 Or read these related posts on AHA Parenting from Dr. Laura Markham: How to Stay Calm? and Your 10 Step Plan to Stop Yelling. 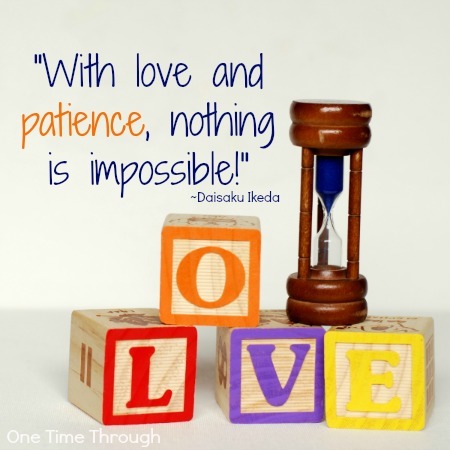 Or check out Judy Arnall’s latest book Parenting With Patience: Turn Frustration Into Connection With 3 Easy Steps Although I haven’t read it yet (it’s on my list! ), her first parenting book, Discipline Without Distress, is one of my very favourites (you can read my review of that one here). You can find all my favourite parenting books here. 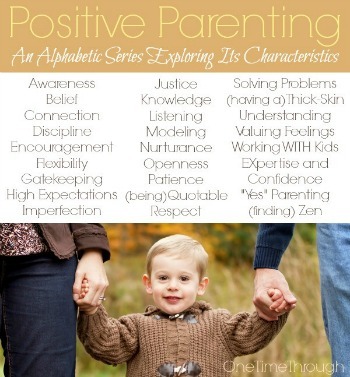 I hope you enjoyed reading today’s Positive Parenting: An Alphabetic Series post: P is for Patience and were inspired by some of the quotes. I’d love to hear which one you like the best. Leave me a comment below! I enjoy reading your site. You seem like such a wonderful mom. Lately i feel like a terrible mom. All of my kids are happy except for one, and I resent how unhappy he is. I am trying to understand his feelings, but he is so unhappy and so young to be so unhappy, I just dont know what to do. He has anxiety and terrible self-esteem and I just dont know how to help him.